Helicopters, models in lingerie, diamonds and acrobats, secret locations and an outdoor venue gave guests the feeling of being part of a Bond movie. This is the new standard for New York Fashion Week. The exclusive Mercedes Club in New York City was the back drop of The Journey Fashion Festival's first show and the new exciting helicopter company FlyNYON was the back drop of the last day of NYFW in a spectacular show series by Malena Belafonte who opened the show with a one minute moment of silence to honor the victims of 9/11. The outdoor fashion show had models hitting the runway from every angle of Mercedes Club's 3 level outdoor venue while guests enjoyed the NY skyline's changing colors from blue skies to the dusky sunset. Paris came to NYC when Christian Lacroix showcased a James Bond vibe in beautifully designed lingerie. KVO Collections, jewelry with a conscience designed by sister duo Julia Ford and Claudia Wood, lit up the runway with diamonds galore on the extra long catwalk. 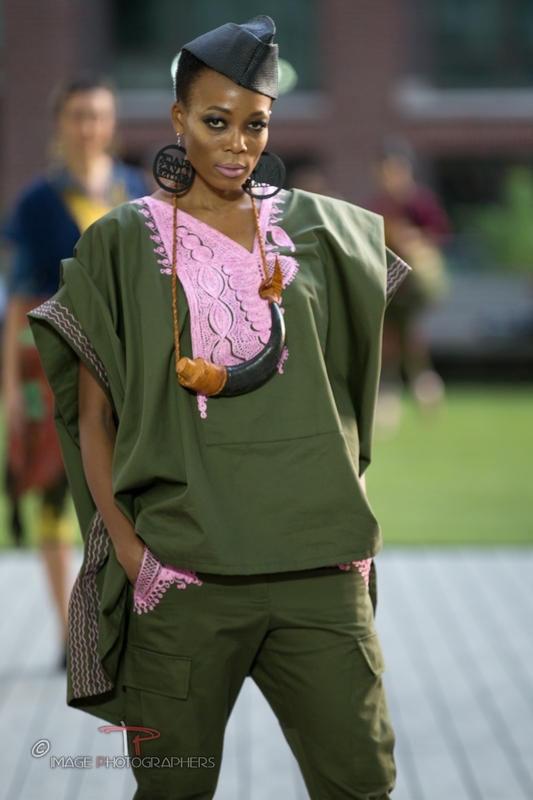 Award winning fashion week veteran, and NY Times lauded most influential designer Lola Faturoti debuted her newest collection Lola Loves Cargo bringing authentic, traditional designs to the modern woman. Layer 8 had athletic tape adorned men and women showcasing the newest technologically engineered athletic underwear designed by industry legend Jennifer Elk. PopImpressKA showed a Marilyn Monroe inspired romantic collection for men, women and children. Former head of Bob Mackie, Haute Couture designer Henry Picado debuted his luxury men's wear collection, while Este and Chlo impressed with a sensual, fashion forward new collection. Make up by Glamazon Beauty and make up artist to the stars Kim Baker. Hair was created by Marcello Costa who also created a firework of hair sculptures featured during the finale. The show was intertwined with a vibe of a cirque like acrobat, bone breaking dancers, Broadway singers, virtual reality experiences and much more for the ultimate theatrical experience in the form of Flex of Brooklyn, Randy Kato, singer Tres Hanley and FlyNyon co-founded by Patrick Day, Jr.
On the last day of NYFW, The Journey Fashion Festival and FlyNyon flew members of the press out by helicopter to an exclusive event at the new headquarters of FlyNYON. Editors and press alike were treated to an incredible VIP event directed by Malena Belafonte with lingerie clad models landing in helicopters, performers, virtual reality and an aerial night tour of the Manhattan' skyline. This was truly what dreams are made of. The Journey Fashion Festival dares where others don't.